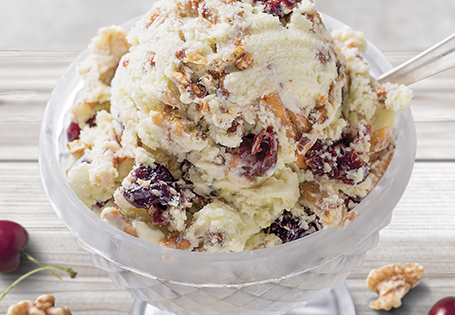 This is a classic recipe for ice cream with a savory twist. Place inner bowl of electric ice cream maker in freezer for 16 hours to overnight to freeze. In a large saucepan, over medium heat, bring cream and milk to a simmer. Cook for 5 minutes, stirring occasionally, do not boil. Add rosemary and cover. Remove from heat and steep for 30 minutes. Preheat oven to 400°. Place walnuts on baking sheet and bake for 8 minutes. Place in refrigerator to chill. Meanwhile, in a small saucepan over medium heat, add cherries, lemon zest, lemon juice, cinnamon, 2 tablespoons sugar and water. Stir to combine and cook for 10 minutes or until liquid is reduced. Place in refrigerator to chill. In a medium bowl, whisk egg yolks, remaining 2 cups of sugar, vanilla and salt. Reserve. Bring cream and rosemary back to a simmer and cook for 5 minutes. Strain into a large measuring cup or bowl. Discard rosemary. Temper the egg mixture by adding ¼ cup of cream to egg mixture, whisking constantly. Slowly pour in remaining mixture and incorporate completely. Return mixture to pot and place on stove. Cook over medium heat until mixture thickens and has a silk-like appearance; stirring constantly, about 5 minutes. Remove from heat and transfer mixture to a metal bowl, place into an ice bath. Continue stirring until mixture cools to 35°, about 5 minutes. Immediately bring out ice cream machine, assemble, turn machine on, add mixture and run for 15 minutes. Add walnuts, cherries and pretzels, run for 5 more minutes. Serve immediately, or freeze up to 3 weeks in a plastic container.